I hope you had a relaxing, recharging summer and productive time. I just thought that I would say hello. And thank everyone for all your kind and supportive words, these have touched me and were totally unexpected. This award has been fun, totally unexpected and no dinner ceremony which would have cost thousands, but as it is Cheshire, I asked my friend and colleague to do this image of me at the top of a hill with the fantastic area of Cheshire behind me, before the green grass turned brown. What a great place to live and work! Thank you to all my clients, associates and friends. 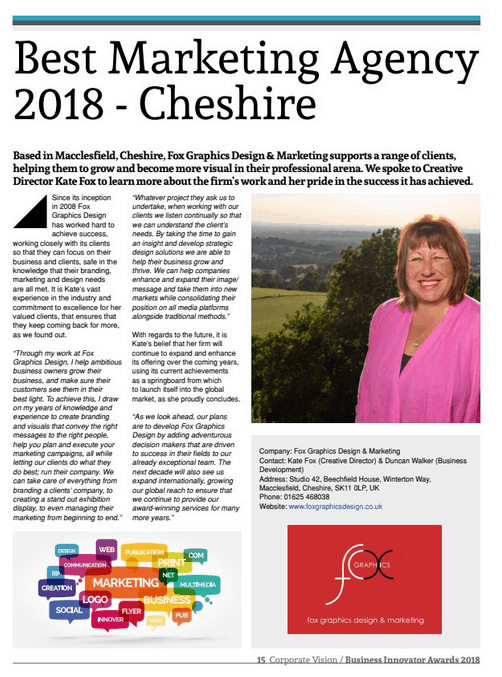 Based in Macclesfield, Cheshire, Fox Graphics Design & Marketing supports a range of clients, helping them to grow and become more visual in their professional arena. We spoke to Creative Director Kate Fox to learn more about the firm’s work and her pride in the success it has achieved. Since its inception in 2008 Fox Graphics Design has worked hard to achieve success, working closely with its clients so that they can focus on their business and clients, safe in the knowledge that their branding, marketing and design needs are all met. It is Kate’s vast experience in the industry and commitment to excellence for her valued clients, that ensures that they keep coming back for more, as we found out. “Through my work at Fox Graphic Design, I help ambitious business owners grow their business, and make sure their customers see them in their best light. To achieve this, I draw on my years of knowledge and experience to create branding and visuals that convey the right messages to the right people, help you plan and execute your marketing campaigns, all while letting our clients do what they do best; run their company. We can take care of everything from branding a clients’ company, to creating a stand out exhibition display, to even managing their marketing from beginning to end. With regards to the future, it is Kate’s belief that her firm will continue to expand and enhance its offering over the coming years, using its current achievements as a springboard from which to launch itself into the global market, as she proudly concludes. Posted in Uncategorised and tagged agencies, animation, business, creative, Design, digialmarketing, digital marketing, exhibitions, graphics, infographics, Manufacturing, marketing, networking, project-managing, recommendations, video, women.